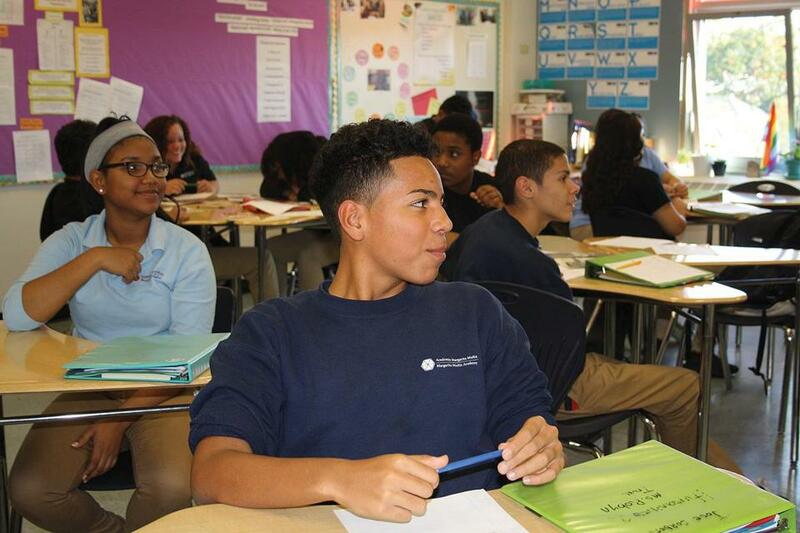 Students in a 10th-grade humanities class at the Muniz Academy. 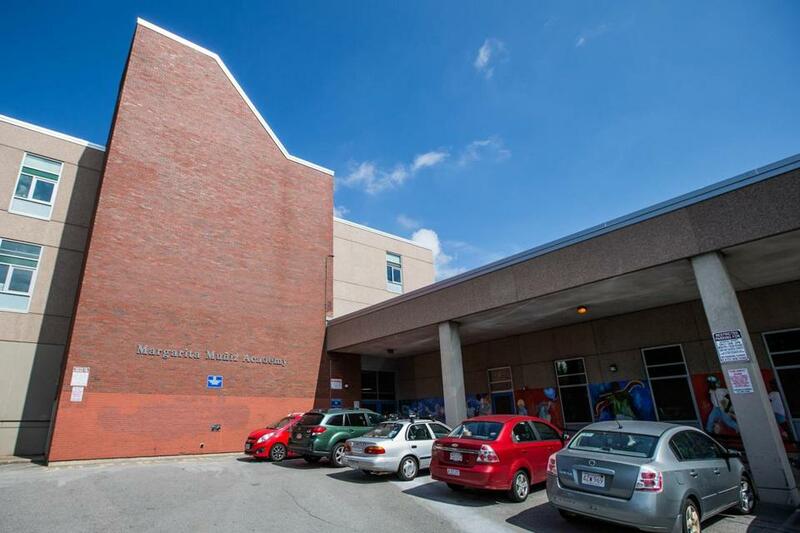 When the Boston Public Schools opened the Margarita Muniz Academy in 2012, it was a first-of-its kind dual-language high school meant to address issues faced by the city’s growing Hispanic population. Hispanic students were both most likely to drop out of the city’s schools and least likely to enroll in college when compared with black, white, and Asian students. They still are, but as it enters its sixth full year, the school’s student outcomes are drawing praise from a variety of sources, though administrators note steep challenges remain. The idea behind Jamaica Plain’s Muniz Academy, named for the longtime principal of Boston’s first dual-language elementary school (the Rafael Hernandez K-8 School), was that many Hispanic students would do better in schools that supported their cultural background and their first language. In Boston Public Schools, roughly 39 percent of Hispanic high school students are classified as “English language learners” because they don’t speak English fluently. Perhaps not surprisingly, these students drop out at higher rates than any other major subgroup. But not at the Muniz Academy. In 2016, 75 percent of its ELL students graduated, just a percentage point below its overall graduation rate, and 14 percentage points higher than the district’s average for this group (the ELLs also bested the overall graduation rate for BPS). Muniz’s graduation and dropout rates have earned applause, says Dania Vazquez, the Muniz’s founding headmaster, but she cautions that “we don’t think we’ve cracked the nut yet.” She says the numbers still leave far too many students without a diploma or the skills they need to succeed in college. Still, the school’s record lends credence to a new districtwide push to support students’ language and culture to foster academic achievement. The information handoff, from home to school and back, can feel like crossing a chasm. Yet there are ways to bridge that gap, and ways schools can help. That demands flexibility on the part of teachers. Inside Matty Long’s 10th-grade biology class one day in April, students chat in English and Spanish as they settle into their seats. As part of a unit on the human digestive system, teams of students have engineered functional models using items like paint rollers, balloons, funnels, and tissue boxes. Today they present their designs. Long teaches this unit in English, but the first group to present speaks in Spanish. They narrate putting a piece of bread into a funnel at the top of their model, adding soda to mimic stomach acid, and the rest of the bread’s trip through the tubes and balloons that portray the digestive system. Long smiles in encouragement as they reference technical vocabulary like vesicula biliar (gallbladder) and intestino delgado (small intestine). Students listen attentively. No one seems confused. When it’s time for questions and feedback, Long and other students speak in English. Nobody misses a beat, including the presenters. Sticking to a prescribed language matters less than making sure students understand the content and participate in class, Long says. That’s particularly true for immigrant students who know very little English. “Things the kids say out loud are the things they’re remembering,” she says. “The more they talk, the better.” The back-and-forth also ensures all students hear key vocabulary and scientific terms in both Spanish and English. 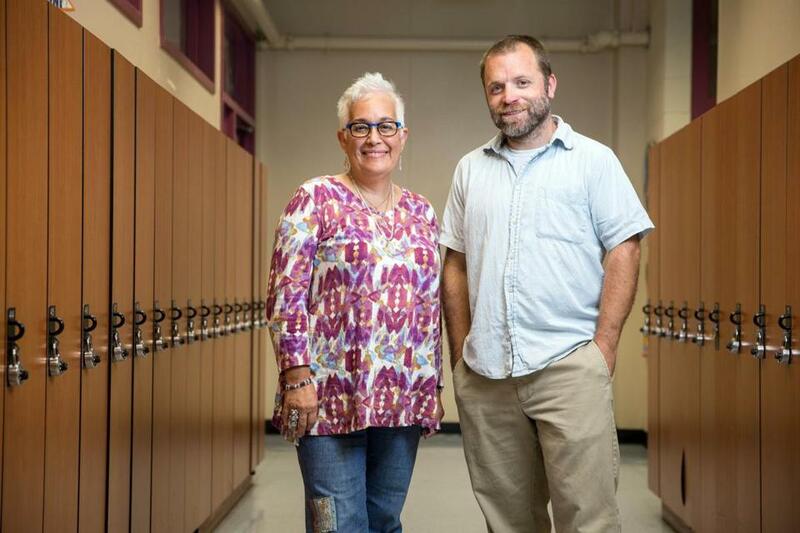 Muniz headmaster Dania Vazquez and assistant headmaster Dan Abramoski say supporting the use of Spanish helps immigrant learners build confidence. Vazquez tells her staff to create a structure for language use in their classrooms, but she says the school embraces the language skills that students bring to the room. This is important because students don’t learn the same content twice, once in English and once in Spanish. They learn something in one language and build on it in the other. Long’s classroom offers one example of how fluid language can be at the Muniz Academy. That’s the goal, anyway. But many students can feel lost trying to speak or write with academic vocabulary in the language they don’t know as well. Even students whose first language is Spanish say they struggle, particularly as freshmen, in Spanish-language classes. Claudette Bautista, a 2017 Muniz graduate who now attends Lesley University, was born in the Dominican Republic but spent her K-8 years in Boston, learning in English. She had taken Spanish language classes and, as a native speaker, breezed through them. But at Muniz, she was learning subjects like history and math in Spanish. “That’s what made it difficult,” she says. 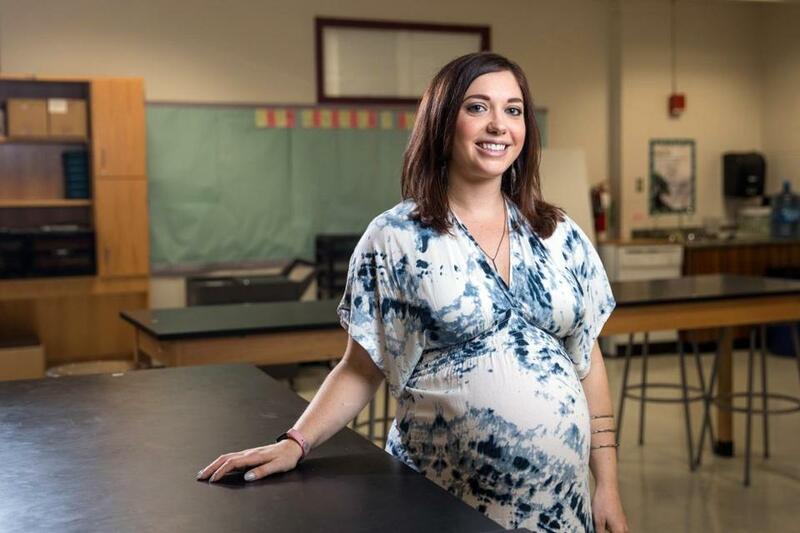 Most Muniz students have a dominant language, roughly split between English and Spanish, so the dual-language model offers everyone a chance to shine at some point. That can be particularly powerful for recent immigrants. There are times, for example, when Spanish-dominant students are the experts who can help the English-dominant students. They have the opportunity to feel the pride of “being the star,” says assistant headmaster Dan Abramoski. And then positions are reversed. “I think it creates compassion among the students and staff and for people who are learning, and that transfers over to art or math or science,” Abramoski says. This can be a huge help for Spanish-dominant students, who would normally be considered academically deficient by a US school because they don’t speak English well. At Muniz, from the start, “they can be excellent in math in Spanish,” Abramoski says. Dual-language education has surged in popularity, driven in part by parents who speak only English and see the value of raising bilingual children who can navigate a globalized world. But Boston’s leaders see dual-language programs as a way to better serve students from the city’s large immigrant communities, and ultimately the city’s employers and institutions. While Muniz is its only dual-language high school, the district has four Spanish-English dual-language programs in elementary and K-8 schools. While BPS did not achieve a hope expressed in 2016 of adding five dual-language or immersion programs by the start of this school year, earlier this year it opened a Haitian Creole-English early childhood center in Mattapan, and it is exploring a similar program for the Cape Verdean community. The approach is a huge shift from what BPS superintendent Tommy Chang experienced when he moved to California from Taiwan at age 6. “Come to school in America and your language gets stomped away,” Chang says. He wants the district to affirm and sustain the languages and cultures of all BPS students, 45 percent of whom speak a first language other than English. Mayor Marty Walsh, the child of Irish immigrants, is a champion of this idea. Economically, he sees the vast promise of a bilingual workforce. Citing figures from a New American Economy report, Walsh says Massachusetts businesses posted nearly 15,000 positions seeking bilingual candidates in 2015. That’s almost a 160 percent increase from just five years before. “When you think about the future economics of the world, it’s not an English world,” Walsh says. While creating new dual-language programs is on the district’s agenda, it may be a while before there’s a second school like the Muniz Academy in Boston — or maybe anywhere. Finding teachers who can lead high school-level courses in two languages is hard. Accommodating students across a wide spectrum of language proficiency is even harder. And of the student body at Muniz, 64 percent are considered economically disadvantaged and 86 percent are high needs. Some of them enroll in the high school reading at fourth-grade levels in their stronger language. Even in more affluent school districts, dual-language programs are uncommon at the high school level. Conor Williams, founder of the Dual Language Learners National Work Group at New America, an education think tank in Washington, says he rarely sees dual-language programs at the high school level, let alone a stand-alone, whole-school program. “It is pretty rare that a district is doing dual immersion and is able to meaningfully extend it into high school,” Williams says. Matty Long teaches science at Muniz Academy. Dual-language programs typically exist as subsets of traditional high schools, where students take classes in a language besides English, though not for a full half of each day. And those students must have participated in such a program since elementary school or demonstrate bilingual skills. That’s the case in Framingham and Millis (for Spanish), as well as Holliston and Milton (for French). The Muniz Academy is unique in the breadth of challenges it strives to overcome while teaching in two languages. “I admire them for taking this on,” says Patricia Gandara, a bilingual education researcher and co-director of The Civil Rights Project/Proyecto Derechos Civiles at UCLA. But the Muniz Academy’s founders started the school because of these challenges, not despite them. And there does seem to be clear payoff for students, particularly English learners. Research shows that when such students get instruction in their native language, they have greater educational success. One reason seems to be that it gives them access to grade-level content that otherwise might be unavailable for months or years as they learn English. Still, the Muniz Academy has its critics. Some don’t believe taxpayer dollars should be spent helping students maintain a native language that isn’t English. Since 2002, official state policy in Massachusetts has been that English learners should be educated in English-only classrooms. 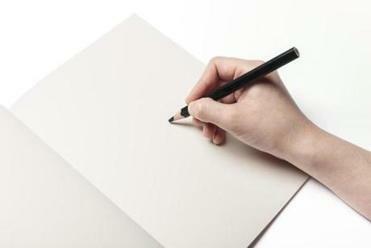 The Muniz Academy exists only because of an exception built into the law. Headmaster Vazquez talks about the school’s existence as a revolution, although she thinks elsewhere in the world it might not seem so special. “In our country we seriously do not understand the value of multilingualism,” Vazquez says. Also, she finds her students face low expectations. “People don’t think our Latino kids are necessarily capable of learning in two languages,” Vazquez says. “That somehow . . . they can only learn one thing at a time.” But every day she watches her students prove that’s not true. Vazquez and other Muniz Academy leaders are working to spread the model. They hope to build out a professional development center to help educators from around the country learn from their work. Meanwhile, Chang wants to find a way for the high school to expand to serving grades 7 through 12. The primary barrier at this point is space, and a possible Muniz expansion will be discussed as part of the district’s BuildBPS facilities master plan. Demand for an expanded program is already there. Muniz Academy in Jamaica Plain. > 73.5% of seniors at Muniz Academy took an Advanced Placement class in 2016-17, compared with 37.1 percent for Boston Public Schools overall, and 40.6 percent statewide. Two-thirds of these Muniz students scored at least 3 (out of 5) on their AP tests, on par with state averages. > 284 students attended Muniz Academy in 2016-17. More than 64 percent were economically disadvantaged, more than 50 percent were English language learners, and more than 11 percent had disabilities. > 93% of Muniz Academy students in 2016-17 were Hispanic, versus 41 percent for Boston Public Schools. Another 4 percent of Muniz students were African-American. White and multi-race/non-Hispanic were just over 1 percent each. Tara Garcia Mathewson is a writer for The Hechinger Report, a nonprofit independent news organization focused on inequality and innovation in education. Hechinger produced this story for the Globe Magazine with support from the Education Writers Association. Find out more at hechingerreport.org. Send comments to magazine@globe.com. Follow us on Twitter @BostonGlobeMag.